We rolled out of Costa Mesa at around 9AM on Friday. 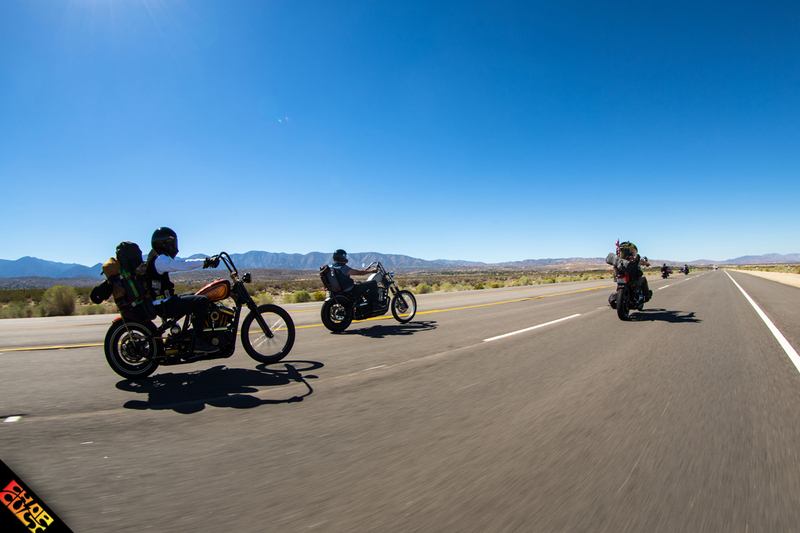 We were in no hurry to get to Kernville, we only wanted to get riding. There were countless ways we could’ve taken to get to our destination, but we decided on one with minimal traffic and a surplus of scenery. Our route took us on the highways for the first hour, until we found ourselves on the road climbing a mountain valley into the town of Wrightwood, California. From there, we continued a chilly ascent to the turn that would drop us into the high desert. The N4 was full of tight switchbacks and views of the desert from behind pine trees. The road unwound in a long, steady decline into the warm desert. For the next few hours we made our way North through the desert, making gas and beer stops along the way. Outside of Inyokern, we made the turn into the next mountain range and our last leg of the journey to Kernville. This last leg was the only section of the ride I had never traveled before. It was during this stretch that I was reminded of the vastness and diversity of California. From mega urban traps, to pine forested mountains, and from sprawling desert wasteland, to rocky valleys settled by farmers, California offers so much for road travelers. Frandy Campground, Biltwell’s chosen venue for the Kernville Kampout, is located on the Eastern bank of the Kern River in the middle of the small town of Kernville, CA. With rocky brown mountains on either sides of the valley, the setting is something to behold. Upon arrival and setting up the sleeping situation it was awesome to get a big cold and free beer provided by 805 Brewing. 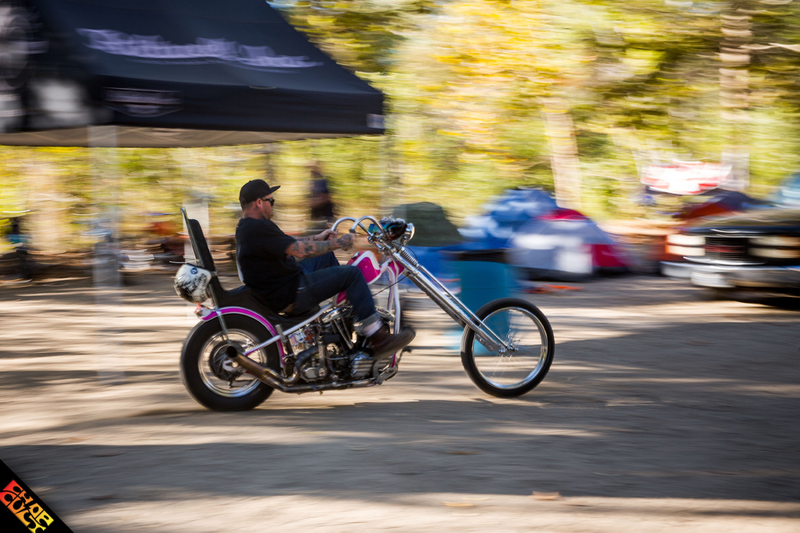 Biltwell and 805 had a prime corner of the campground set aside for the evening’s festivities, which included more free beer, old biker movies projected on the side of their trailer and fires to warm the crowds. One of the highlights of the evening was getting some additional entertainment from Chris Huber as he did his version of Mystery Science Theater 3000 over the mic while “The Glory Stompers” played. It may have been the free beer or the day's ride talking, but I’m pretty sure he even free-styled his own version of a theme song at one point: Sweet Blueberry Wine! Word of rain forecast for the next day spread through the campsite on Saturday evening. I, for one, don’t prefer to ride in the rain, if I can avoid it. I especially don’t enjoy doing it while hung-over. After a dip in the river, I packed my gear on the bike and headed out for the chilly ride back. A few gas stations, a Denny’s and a coffee later I was back home. Big thanks to 805 Beer for keeping everyone’s thirst quenched for the weekend. 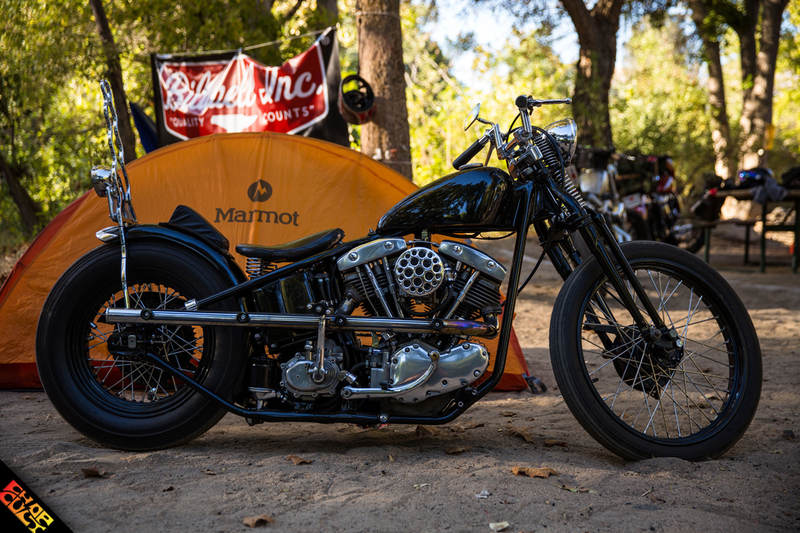 Massive shout-out to Bill, Magoo and everyone else at Biltwell for continuing to bring people together with events like Kernville Kampout and EDR. Cheers to everyone that I got to meet and hang out with. Until the next gathering! Please check the Kernville Kampout site for updates and give Ryan a follow on Instagram for his contribution and coverage! Great Stuff Ryan! Looks like a blast.